The Society for Classical Studies (SCS) invites doctoral programs in Classics or Ancient History to nominate a student to participate in a 6-week seminar that will introduce ten graduate students to the use of material culture in their scholarship and teaching. The aim of this seminar is to familiarize students with archaeological material that goes hand in hand with the historical and literary records, and how to incorporate such evidence into historical or philological research. This seminar will be the second of three with the same purpose but with different foci and at different institutions. The first took place at the J. Paul Getty Museum in 2016; the third will be held in 2018. Background. Despite new awareness of the scope of material evidence, and the ready availability of excellent images, all too often literary scholars treat images as decoration or illustration, while historians exploit the material record only gingerly. Probably more important than “literature” was the oral tradition, and the essential web of images that arose from it. Conversely, it has been wisely said of archaeology that it is a branch of ancient history. This seminar offers students an opportunity to engage with the material record on a daily basis. Over the six weeks, every effort will be made to introduce the widest range of possibilities encountered in the archaeological record. Not only pottery and sculpture in bronze and marble will be considered, but also works in precious or exotic materials like ivory, gold, silver, amber, gems, glass, faience, and colored stones. Questions of facture and circulation will predominate: how these objects were made, by whom, for whom, why, and how to recognize them in the literary, historical and epigraphic record. Participants will have access to the Museum’s collections of Egyptian, Nubian, Near Eastern, Greek, Etruscan and Roman antiquities, both those on view in the galleries and those in storage. The latter, which will be used daily for teaching, include notably rich holdings of fine pottery and gems. The Karen Mariea Madsen Parsons Conservation Laboratory, the Thalia N. Carlos Education Center and its staff are also participants, as are Emory faculty members. An extensive collection of plaster casts of ancient sculpture, and models of the sanctuaries at Delphi, Olympia and the Athenian Acropolis on long-term loan from the Metropolitan Museum of Art are sprinkled among several buildings on campus. Further resources include the two principal campus libraries, the Robert W. Woodruff together with the Stuart A. Rose Manuscripts and Rare Books Library; and The Pitts Theology Library. Besides resources at Emory, the course will include the participation of Prof. Patricia Butz, Savannah College of Art and Design, on treasuries and their inscriptions; Prof. Mark Abbe, University of Georgia at Athens, on polychromy and color on ancient sculpture; and Prof. Peter Bing, University of Toronto, on the new Posidippos papyrus and hellenistic gems. The course is co-ordinated by Jasper Gaunt, Curator of Greek and Roman Art at the Michael C. Carlos Museum. He is the joint editor with A.J. 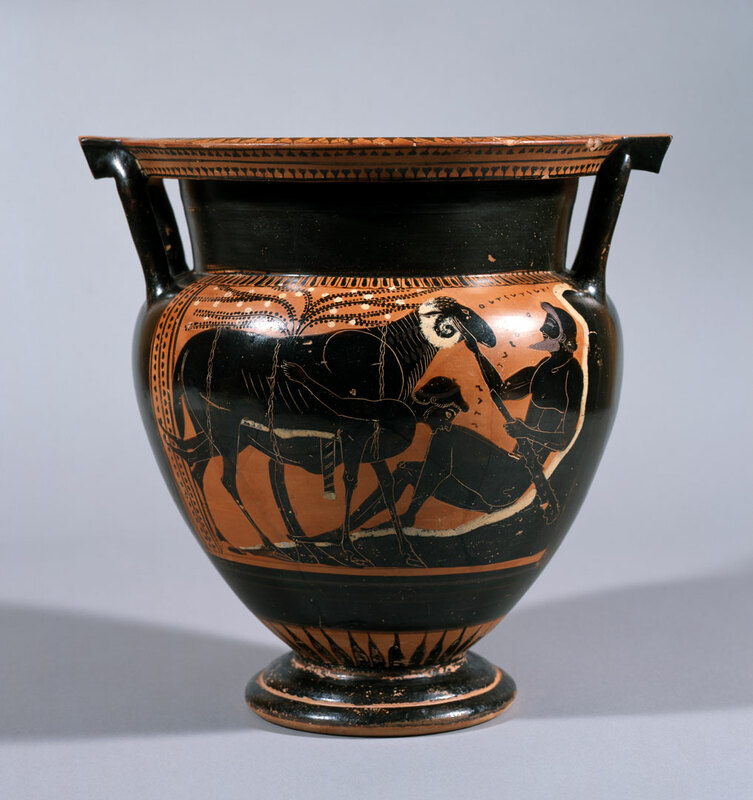 Clark of Essays in Honor of Dietrich von Bothmer (Amsterdam 2002), and has published widely on Greek vase-painting (including a volume of the Corpus Vasorum Antiquorum: Great Britain 21: Harrow School, 2005), vessels in bronze and marble, metrical inscriptions on pottery, and reception studies. The seminar is structured in broadly chronological terms. The importance of time allocated for students to absorb material in the galleries in their own ways cannot be overstated. Three two-hour classes are planned each week around an over-arching theme, outlined in the synopsis. Provision is also made each afternoon for further opportunities to handle original objects. Excursions to local artists’ workshops – such as glass-blowing, gold working and a bronze foundry – are planned on Friday afternoons, as is a day trip to see the Nashville Parthenon and its life-size reproduction of the chryselephantine cult statue. It is proposed that students will undertake small assignments on an on-going basis, intended primarily to foster familiarity with the world of objects. These will include informal mini-presentations on objects in the Carlos Museum’s collections, gallery talks, and some sketching. Over the course of the seminar, participants will work on a paper to be presented in the last week. The subject will be of the student’s choice, rising out of their research interests, but in conjunction with the course co-ordinator, who will allocate generous weekly time to meet with students individually. Students selected for the seminar will be offered free accommodation at the Clairmont Campus of Emory University. A shuttle service operates between this campus and the main one where the seminar will be held. Both on campus and within walking distance of campus can be found a variety of shops, grocery stores and places to eat. Some public transportation, and taxi services like Uber, work well. In other words, the use of a car is not essential. The cost of car rental is greatly reduced if the airport is avoided. In addition, thanks to the generosity of the Samuel H. Kress and Henry Luce Foundations, the SCS will provide a stipend of up to $2,000 to cover the cost of travel to and from Atlanta, and modest out of pocket expenses. The SCS believes that these arrangements will offset many but by no means all of the costs of attendance at the seminar. Each doctoral program may nominate only one student for the seminar. The focus of the student’s academic work should be classical languages, literatures, and/or history and not archaeology or other areas of material culture. Preference will be given to graduate students who are still taking coursework or in the early stages of writing their dissertation. Nominators should elicit from potential applicants a CV and a statement of the value that the student expects to derive from attending the seminar, choose one applicant to nominate, and forward the CV and statement to the SCS Executive Director (xd@classicalstudies.org), along with a brief endorsement. The student’s statement should be 500 to 700 words in length and should describe how the seminar would advance the applicant’s education and scholarly interests. The student him or herself should also email the Executive Director (xd@classicalstudies.org) with full name, mailing address, phone number. A committee consisting of Dr Gaunt as chair and Professors Mary English (SCS Vice President for Education) and Donald Mastronarde (SCS VP for Publications and Research) will select participants from ten different academic institutions and a variety of countries of origin. Although many applicants from North America are expected, students from all countries are equally welcome. Reasonable fluency in English is the only requirement. Nominations by departments and emails from student nominees including their full contact information should be submitted electronically to xd@classicalstudies.org no later than 1 January 2017. The SCS will announce the decisions of the selection committee in early February 2017. Questions about the seminar program may be directed to Dr Gaunt at jgaunt@emory.edu or by telephone at 404 727 1146. Each week has an over-arching (chronological) theme that is explored in a two-hour class on Monday, Wednesday and Friday 9.30–11.30. On Mondays through Thursdays, an afternoon session 2.30–4:00 is offered during which original works of art that are relevant to the topics discussed during the week are handled, and questions of manufacture discussed. On Friday afternoons, excursions are planned to studios of artists working in different media.